The property is situated in the south of the island on the top of a hill, in a very quiet area (no neighbours), among almond trees and algarrobas, surrounded by the typical dry-stoned walls: natural Majorca at its best. You'll enjoy the "Patio de los naranjos" and all the surroundings Guests have full access to an independant kitchen in a separate small house. Several villages at walking distance. Picturesque market towns of Santanyi- a must on Saturday and wednesday Alqueria Blanca, Campos (Flee market) and Felanitx . Nearby, the endless beaches of Es Trenc , Sa Rapita or the Natural Park of Mondragó for sea-worshippers. From Colonia San Jordi-12 km- boat excursions (20' ) to the Natural Sea Park of Cabrera- another small island of the Balearics- where tortoises being born there and living wild can currently be seen. Every fisherman's village of the south coast offers a wide range of restaurants: Porto Petro, Porto Colom, Colonia San Jordi....Busy night life in Cala d'Or-14 km. Hola! My name is Marie but you can choose Mary or even Marí. I've been living in this house for 12 years and I love it. Even if it seems too big for me, as it is now. The family has changed, some have gone for ever. Luckily, my daughter Manuella lives here with me now . Both of us are willing to do our best to make our hosts feel at home and love that place as much as we do. You'll see, it's so quiet, sunny and different. Just listen to the birds singing in the sycomore trees... Sorry, we have no sycomore trees. Just almendros (almond trees) algarobas (?) higueras (fig trees). And orange trees too, that you can have (pressed) for breakfast as well as our special home-made marmalades. Our home- your home for your holidays- may be a little hard to find but, beleive me, it's worth it. Again and again, the incredibly peaceful atmosphere. Whilst living here, you have the feeling that the outside world is so far away. The only sound I am hearing while writing is the song of the so many birds. Oh, I'm hearing another sound: the ovejas (female sheep) bells which are out in the fields with their cabritos (lambs). Let me tell you more: when I opened my windows, this morning, I met 3 rabbits on their way to the pool, probably thirsty. It's joyful to watch them, thinking that the scene might come from Walt Disney's "Bambi". You really feel yourself in the deep majorcan countryside as it has been for centuries. Yet, it's nice to know that a 15' drive will lead you to some picturesque "calas" unless you prefer a caribean-style endless beach. That's why Casa M is unique. Notes on accommodation: The Blue Room and the Yellow Room have a double bed and a complete private bath-room. They can be transformed to doubles with twin-beds. Extra beds for kids. The Loft is perfect for families with young kids: 2 double beds + extra beds if necessary. The terrace is secured. The rental price of the Loft is higher than the rooms. We also provide a cot for babies. Large double closets. Fans in the ceiling. The house being situated on the top of a hill, the place is always a little windy, even during summer hottest days. 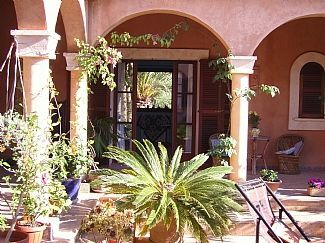 Direct entrance to the rooms from the Patio or from the upstairs terrace. Internet access everywhere through our private WiFi. TV in the rooms on request. The separate kitchen, where the guests can prepare their meals when they do not want to go to the restaurant, is fully equipped. Check in and out with maximum flexibility, according to plane schedules and our reservations. Outside: Tropical patio. lawns, gardens, large fields mainly planted with almond trees in the very typical mediterranean countryside completely surrounded by the typical stoned walls. Different species of fruit trees : orange, lemon , fig, local "gingols" or " iguos chumpos". Lavender. Tamaris alley. Eucalyptus trees alley. Large wild space. All kind of outdoor furniture: rocking-chairs, hammocks... Sun-decks around the 50 sq.m swimming -pool. BBQ by the pool and the main outdoor dining-room. Verandah with dining-room at the kitchen house. We stayed with Marie this summer and had a wonderful time. We have 2 boys (aged 6 & 8) and they loved it. The pool was glorious which we had just to ourselves, the boys enjoyed riding on their pony and feeding it carrots. The family are very welcoming, speak excellent English as well as fluent French & Spanish of course. The facilities are great - we had our own kitchen and outside eating areas in the shade, lots of sun loungers, hammock etc to just read and relax. There is a lot to do locally with nice beaches but to be honest we enjoyed relaxing by the pool and eating out in the evenings. I would highly recommend the accommodation. Beautiful big rooms with en-suites and we enjoyed breakfast on their veranda every morning. Die Finca wird von Marie, ihrer Tochter Manuela und deren Mann bewohnt. Wir wurden direkt als wir ankamen freundlich empfangen und fühlten uns direkt wohl :-). Der Garten bzw. das Areal, welches man nutzen darf ist riiiiiiesig und man hat wirklich alles was man braucht. Zudem bekommt man jeden morgen ein leckeres Frühstück mit vielen frischen Früchten. In das wunderschöne Städtchen Santanyi sind es ca. 10 Minuten mit dem Auto. Danke für die schöne Zeit bei euch !! Awesome Place, every time again!!! Nice place to be to relax and enjoying recreation with first class service and everything you need!!! Beaches are distant from 10 to 15 km. You have to drive to get there. Son Sant Juan Airport (12 km from Palma de Mallorca) is 37 km from our place. It is better to hire a car. Parking available inside. Santanyi, the nearest and most picturesque village: 4km. Manacor, city of Majorica pearls: 21 km. Banks, supermarkets, shops and in every small town mentionned above. Booking Notes: Booking by mail- mariesaurat@hotmail.com- or SMS. Reservation (through Paypal or Bank transfer). - 30% deposit. Payments: 30% on arriving. - 40% on leaving. As for Stay Tax, nothing has been settled as far as now. Changeover Day: Flexible. Arrival and departure times are flexible too, according to the guests' schedules and our reservations. Notes on prices: Price by week, for 2 persons. Chidren under 3 are free- a small supplement will be due for more than 3 years old, according to their age. Supplementary adult: 10€/night Included the use of an independant kitchen where the guests can cook their own meals. Washing-room also available for free. The rental Price of the Loft is higher and a supplement might be paid according to the number of persons living in it Prices by night on request. Minimum stay:3 nights. Special discount for stays over than 2 weeks Promotional prices.